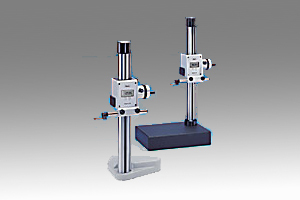 Application Range 320/ 12.6" 620/24.4"
For measuring heights, center distances between bores, surfaces and width of ledges. Also for marking and scribing of parts. Sturdy column. Measuring head with accurate ball bush guiding system, adjustable in height by hand crank and to be locked at any desired point. With fine setting. Digital display with large figures. Zero setting in any position. With digital preset and data output. Universal mounting for measuring, scribing, and centering elements. Standard model with cast iron base and measuring table model with table plate made of hard granite. Easy conversion from one model to the other. Cast iron base and granite table plate available separately. With extra rugged, cast iron base with three-point support. To be used on base plates, machine beds and workpiece surfaces. With table plate made of fine grained black granite (greenstone) of great hardness and form stability. Table surface 300 mm x 200 mm (11.81 in x 7.87 in). For testing large workpieces, column with measuring head can be turned thus pointing to the rear. High accuracy-Due to precise ball bush guiding system of the measuring head plus the non-contact electronic system. The latter is composed of an incremental scale and a capacitive transducer. The measuring system has no mechanical components, thus eliminating wear and ensuring high accuracy. Digital display-The result is shown in large figures. Convenient handling-Electronic system and display incorporated in measuring head. No separate indicator necessary. Constant measuring force-Acting upwards or downwards, as required. Zero setting at any position-Fine setting provided. Facilitates setting the measuring head to the desired dimension especially for scribing jobs. Choice of display-Metric and inch reading selectable. Digital pre-setting-Reference dimensions are entered digitally and automatically allowed for during each measurement. Independent of power supply-Battery life 2,000 working hours. Measuring data processing-Via the serial interface RS 232 C, data can be transmitted to an A4 printer or evaluation computer. Universal application-Due to versatile accessories. Exchangeable bases-With accessories 814 Nf (cast iron base) and 814 Gf (table plate).